Nottinghamshire edged towards a seventh win of 2017 despite a rain-hit third day against Northants at Trent Bridge. The unbeaten Division Two leaders will need a further six wickets on the final day after Northants, chasing 417 to win, were reduced to 167-4. After a delayed start, Riki Wessels (116) and Jake Ball (28 not out) scored quickly to take their stand to 117 and allow Notts to declare on 344-9. Northants reached 113-1, but lost three wickets to leave Notts well on top. Rain prevented any play in the morning session, but Wessels and Ball then went on the attack to record the county's best ninth-wicket partnership against Northants. 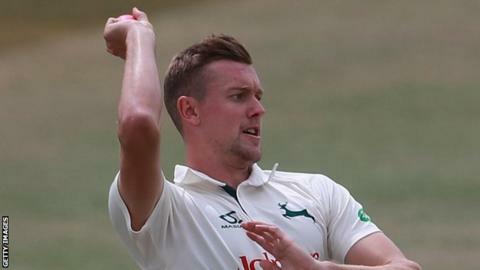 Notts declared when Wessels was caught off Mohammad Azharullah (3-73) and, after another delay, Rob Newton (53) and David Murphy (30) made a solid start to the visitors' second innings. However, Samit Patel trapped Murphy lbw and three wickets fell for nine runs when England paceman Ball (2-56) found his rhythm to leave a Notts victory the most likely outcome. "We've put ourselves in a really good position in that last session. We didn't bowl as well as we could with the new ball but we've dragged it back nicely. "Sometimes when you get on pitches where you know it is going to be doing a bit it can be easy to stick it up there and you go for a couple. "We know the lengths we have to bowl. It's slightly fuller than you normally want - and then you get driven - but we feel we've got enough runs on the board to put them under pressure." "It's been a tough couple of days with the injuries, particularly. We weren't in a bad position when Ben Sanderson went down but, unfortunately, you can only flog your seamers for so long and that really hurt us. "We battled really hard throughout the day, so we've put ourselves within an outside chance, especially with a bit of rain. You don't know. "We're not always seen as the toughest in terms of being tough to get out. With the start we had maybe we could have been one better but I think we'd have taken 167-4."